Our two day trek from Denver to Chicago was much more enjoyable than one fifteen hour day. L to R: Our reflection on a tanker truck crossing Nebraska, Bob Kerrey pedestrian bridge between Omaha and Council Bluffs, Wind turbines along I-80 in western Iowa. A lot of people have an aversion to road trips because they don’t like riding in a car for hours on end. On any long route, there is inevitably a day or two of long hauls between destinations. We’ve found that if we limit the time spent driving in a day, it makes the experience much more tolerable. About eight hours is the sweet spot for us. We both grew up in families that took long road trips in the days before in-car DVD players (travel bingo anyone?) so neither of us has a problem with long drives. Your results and patience may vary. We may have been known to break into song around hour seven, but that’s a rare case. It’s no fun rushing out of a hotel, sitting in a car for 14 hours and then eating some fast food and going to bed. By limiting our drive times to 8 hours it creates a nice day schedule of a leisurely breakfast, drive four-hours, stop for lunch, drive four more hours and then arrive at a stopping point in time for a little sightseeing, a nice dinner and a couple drinks before resting for the next day. We also generally trade driving duties every 2-3 hours. 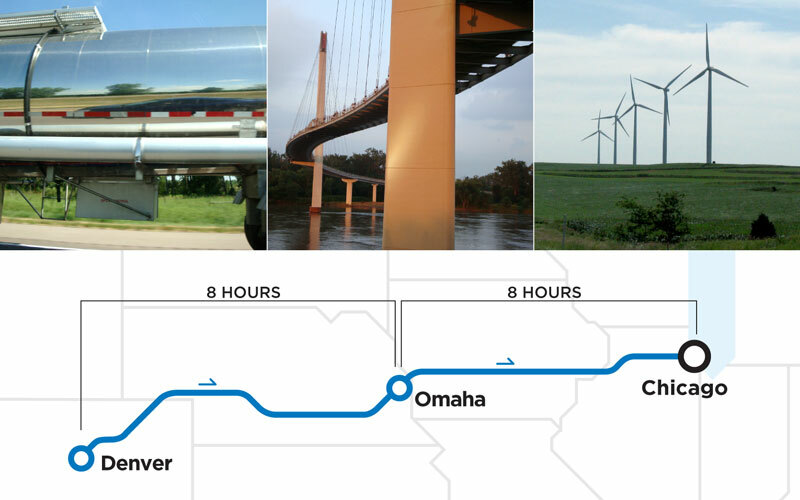 For example, on our 2009 Western Loop, we took two days to get back to Chicago from Denver, stopping overnight at the halfway point of Omaha, Nebraska. We were able to use the hotel pool, check out the riverfront and Heartland of America Park, followed by a great meal at Twisted Fork and drinks in the Old Market neighborhood. We were glad we stopped and explored a bit of a new city and by the time we got back to the hotel we’d forgotten we’d spent eight hours in the car that day. The next morning we were refreshed for the final eight hour roll home. Last year, Memphis also worked well as an approximate halfway point on the way to and from New Orleans. Why drive yourself crazy going all-out in one 15 hour day, when you can make a much more pleasant two-day jaunt? This entry was posted in Travel Tips and tagged 8 hour drive, Denver to Chicago road trip, Long drive, Omaha to Chicago, Road trip tips. Bookmark the permalink.